If you’re a fan of mushrooms then this is the perfect recipe. Soft, silky and fabulously tasty. At your deli buy a selection of mushrooms, I used swiss browns, white mushroom cups, hon-shimeji, oyster mushrooms and dried porcini mushrooms. Don’t skint on mushrooms, they will shrink and you will wish you had more. Typically for two people I use about 5 heaped handfuls of mushrooms for 2 people. Large selection of mushrooms – 5 heaped handfuls or more. Soak porcini mushrooms in 100mL boiling water for 20mins. Finely chop the onion and sautee in a large pan with olive oil and some butter. When softened add the minced garlic. Cook on medium heat till garlic is cooked but don’t let it colour. Add mushrooms to pan, starting with the firmer larger mushrooms and cooked till wilted and softened. Add the porcini water to the mushroom pan and reduce. Add veggie stock so the pushroom mixture reamins sloppy and hydrated. In a separate pot of boiling salted water, cook the risoni until half cooked then drain and add to the mushroom pan. 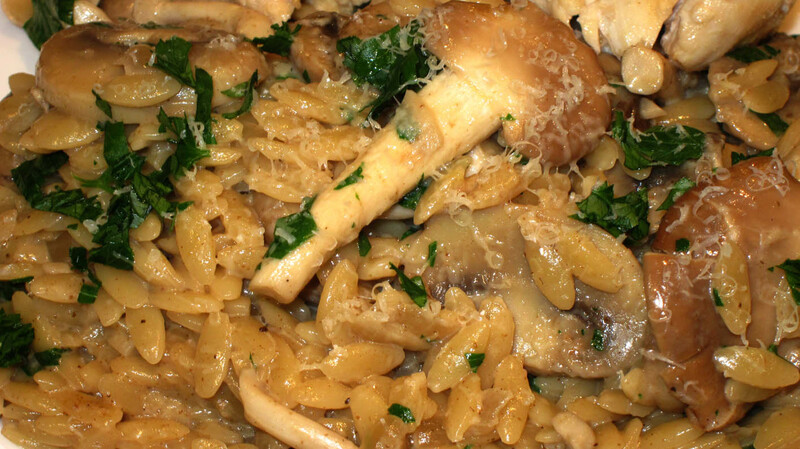 Stir risoni mushroom mixture and cook a la risotto. Add stock if the mixture dries out too much. I like to cover with the lid so all the pasta absorbs the mushroom flavoured liquid, rather than evaporating. When almost ready, add the more delicate hon-shimeji and oyster mushrooms. Stir and keep cooking until the new mushrooms are soft. At this stage you should have a nice moist risotto like consistency. Add some cream, chopped parsley and grated parmigiano-reggiano and seasoning. Stir till combined. Serve with more chopped parsley and copious amounts of parmigiano-reggiano. Tags: dinner, mushroom, recipe. Bookmark the permalink.